To understand why it was important for the Swiss to do what we in America simply don’t have the guts to, you must understand what the minarets symbolize and why they are there. It’s epitomized in the phrase “allahu akbar.” The phrase does not mean–as has been repeatedly reported–that allah is great. It means “allah is the greatest” or “allah is the greater,” as in greater than the Christian and Jewish G-ds and that of any other religion. And the minarets on mosques are the architectural version of that. They establish Muslim supremacy. Minarets make a mosque higher than any building surrounding it, higher than any church, higher than any synagogue, higher than any Buddhist temple. And that’s the point of the minaret. There is no other function other than the loud announcement of Islamic supremacy that consciously betray the smarmy Muslim pretense of “co-existence” BS and “interfaith” blah-blah-blah. Muslims have this thing for towers. Remember how they took down two of ours in New York? They chose those for the same reason they use minarets to establish their dominance. Size matters. And these faux modesty-obsessed Muslims are actually really more obsessed with sexual and phallic symbols than any other organized modern religion. ....There’s a reason there are Islamic crescents atop every minaret, and it’s the same reason for the minaret in the first place: to establish Islam’s tower over all else that surrounds it. 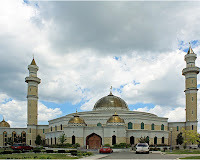 When Dearbornistan’s Islamic Center of America–the largest mosque in North America and a hotbed of Hezbollah in America–was built, it was built far taller, especially with its twin minarets, than any of the churches on either side of it, and even the senior citizens’ high rise apartment building in the vicinity. This was done deliberately–to establish Islamic supremacy. It’s a statement: “We are taller than all of you, we are higher up spiritually and in every other way.” Iran and Shi’ite backers financed the place in order to make it so. There’s a reason it dominates the landscape of Dearbornistan’s Ford Road. The Muslims have conquered Henry Ford’s vision of Dearbornistan, their minarets towering higher than any smokestacks from the dying Ford factories.